It might not look like much, but here’s the deal: The photo was taken on a cold day when the bees in all of my other hives were huddled inside trying to stay warm. But the bees in this colony were flying frantically around the bottom entrance and there were more dead bees in the snow in front of this hive than any of the others, probably from the bees flying out and instantly freezing to death. More dead bees in front of one hive isn’t great, but it’s not necessarily the end of the world. The telltale sign for me was the fact that a large number of bees were flying in and out of the bottom entrance on a freezing cold windy day when they’d normally stay inside. Something had them spooked. I realized afterwards, that was the day a shrew got inside the hive. And there was nothing I could do about it because it was too cold to open the hive (or so I thought at the time). I came back a few days later and found even more dead bees outside the hive and knew for sure something was absolutely not right. 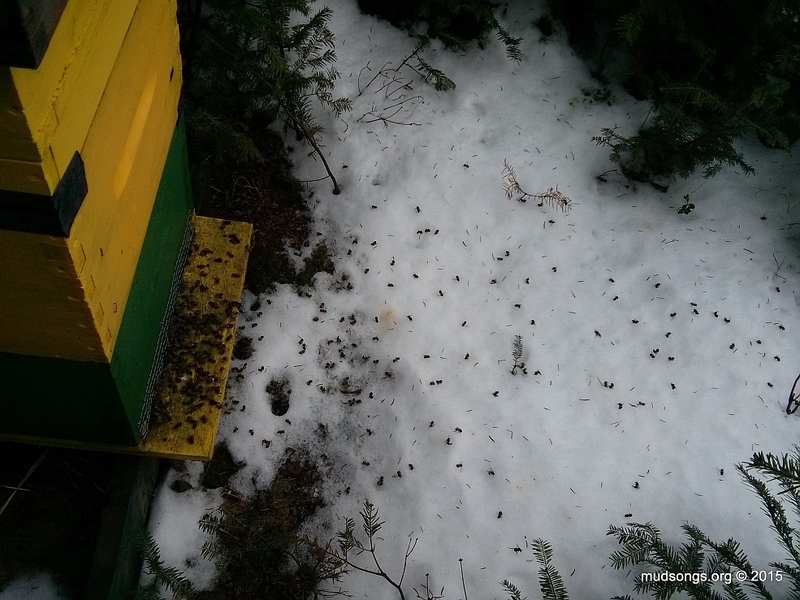 This particular colony was small because it was started from a late-season swarm. It was dead about three weeks later. 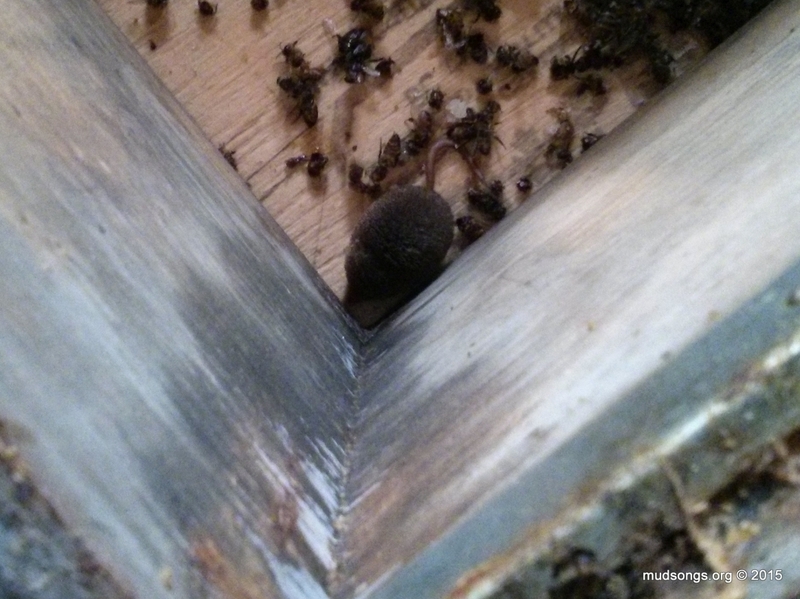 I saw other signs of a shrew inside the hive over those three weeks but didn’t know what I was looking at. I brought the dead hive home to do a postmortem and found the shrew, alive and well, between two frames where the brood nest used to be. Today, if I discovered any sign of a shrew inside a hive, I’d tear the hive apart and scare away the shrew, or I’d remove the frames of the brood nest and place them in a new, clean, shrew-proof hive box. Exposing the bees to cold winter air is normally a terrible idea, but if I have to choose between that and allowing a colony to be literally eaten to death by a damn shrew, I’ll take my chances and tear the hive apart any day. A large number of agitated bees pouring out of the bottom entrance on a freezing cold day is not a definitive sign of a shrew inside a hive. But when you’ve got seven other hives showing no signs of activity on the same freezing cold day, I think it’s fair to suspect something’s up. Likewise, a large number of dead bees in the snow in front of a hive is an even less definitive sign of a shrew inside a hive. But when you’ve got seven other colonies with barely a spec of dead bees in front of their hives, I think it’s fair to suspect something’s up. So far I’ve only described possible signs of shrews outside the hive. The situation got much worse after I looked inside my other hives. What I found left no room for doubt. I’ll save that for Part Two (which I’ll post sometime in the winter of 2017). This entry was posted in Diseases & Pests, Mesh, Month of February, Month of January, Month of March, Shrews and tagged Stuff That's Good To Know. Bookmark the permalink. Shrews must be a particular problem local to your area, I’ve never heard other beekeepers complain about them. I’d love to see some (but not anywhere near my hives!). Just proves what you always say about all beekeeping being local. I’d never heard of shrews being a problem until they were a problem for me. Then I asked around and heard from other beekeepers who suddenly had a problem with shrews too. The winter conditions last year seemed ideal for shrews. I am a bee keeper based on Anglesey, North Wales, UK. For the first time ever I noticed large numbers of bee carcasses under the floor of two of my hives this Spring, on top of the corrux catch-trays, along with what I took to be mice faeces. I use swivel doors on my hives and these can be pushed in to restrict the entrance to a single bee-width (or close up completely) during the winter, so I have never (before) had problems with mice. Having seen this website, I will go back and have a closer look at those faeces – this is a very rural area and, since my cat died last year rodent numbers seem to be spiralling! Shrews may well be part of the problem. …shows a photo of shrew faeces and the bee body parts left behind by the shrews feeding on the bees. I have more photos and video ready for part 2 of this post, but I may not have the time to post it until next winter. I have hive stands with the legs sitting in containers of vegetable oil, and today I found a drowned shrew in there. Gross! I’m glad I’m using these moats- it kept that nasty shrew out of my hive and away from my young colony. I found lots of floating slugs and a handful of bees and wasps in there. But the shrew really took me by surprise so early in the season. Maybe its time to put on the those mouse/shrew guards!